Before the Conklinville dam was built and the Sacandaga Valley flooded in 1930 the Sacandaga River was spanned by bridges both covered floating.In the next coming weeks bridges will be the topic of the history column. They will include Copeland , Conklinville, Vlaie Creek, Northville, Batchellerville, Osborne’s and Fish House. The covered bridge was born of the necessity to prolong the life of labor intensive bridgework . Different kinds of trusses were used to build and accommodate the spans. Truss names were: king truss, queen truss, Burr truss, Town or lattice truss, and Howe truss. First covered bridge was built in the United States was in 1792 in Massachusetts over the Merrimack river. In the Sacandaga River Valley the first area settled in 1700‘s was Fish House along with the first area’s covered bridge in 1814. Osbornes bridge was next in 1840. In 1860 a covered bridge was built in Northville and was lost 25 years later. The history as to whether a bridge existed before 1860 has been lost so no details or photos were found in references. Fish House and Osbornes survived until the man made flood of 1930. A private covered bridge was built 1879 in Beechers Hollow in Edinburg and still stands today. In many cases, all bridges in a particular area used the same truss — having been built by the same builders, or, at least, approved by the same county services. But the span to be crossed would govern the final architecture of the bridge. Sleds and sleighs were vital to transport people and goods. Our romantic vision of a horse drawn sleigh gliding across the snow to a covered bridge involved much more labor than that. Instead of snow removal like we require today, the bridges had to be snow paved. Snow had to be brought into these bridges and packed on the plank flooring. The task to “snow-pave” the deck of covered bridges was labor intensive but vital to the longevity of the decking. Sleigh rails without the benfit of a snow or icy surface would damage the wood. Even when the snow was frequently gone from the woods and fields of the countryside by winters end , it often remained packed on the roads and bridges when spring’s thaw began. To facilitate winter road transportation, many northern communities used snow rollers to pack down the snow, thus making a road smoother and the snow surface longer lasting than an ungroomed snow surface. Snow rollers were large, single wide-wheeled vehicles with logs or rocks as ballast to give it weight, usually pulled or pushed by a team of oxen. They were operated by men employed by the community as snow wardens. Their critical job was to pack the snow upon local roadways and fill in melted or otherwise bare spots to keep sleds and sleighs moving with ease. Bridge roofs kept the weather from rotting the plank floor. With cut out windows, the air was allowed to circulate within the bridge or maybe provide a place to lean out with a fish pole into the stream or river below. In the early 20th century, covered bridges were sometimes nicknamed “kissing bridges”, as the cover allowed seclusion for couples to express affection. Posters of events and business ads were sometimes hung inside covered bridges to advertise. Sacandaga River bridges and abutments withstood a great onslaught in the spring; not only swift flowing water but of ice the inevitable log jams due to the logging industry that started when the river opened enough to send logs on their way to the mills. The Northville covered bridge was of lattice or Town truss construction. It was swept away March 22nd 1885 as the train pulled into the Northville station on a Sunday afternoon. Passengers’ on the FJ&G witnessed the power of nature as the ice and water carried away the bridge. This left everyone on the train with few options to cross over to Northville. The closest bridge to cross would be Osborne’s or Fish house. Leaving the train by foot or stage to cross these bridges or returning to Gloversville by train would have been the options. Northville officials acted immediately to replace the bridge. Croton steel of Croton NY was contracted to build the bridge which lasted until the man made flood of 1930. The road that lead to steel bridge had a slight incline to it’s grade . Horse drawn wagons and stages had to get somewhat of a running start to get to the level bridge deck. A fine was imposed to any horse drawn transportation of $5.00 for going faster than a walk on the bridge. This bridge was then replaced what many may remember as the blue bridge. Costs for construction of Northville Bridges through the years: In 1860: $2,500 wooden covered, 1885 $11,900 first steel, 1930: $152,675 blue bridge and 1990: $4,900,000 current bridge. The only covered bridge to survive in our area is the Arad Copeland covered bridge. A farmer, Arad had 35 acres across Beecher Creek in the town of Edinburg where he had garden and pasture land. An open bridge below the current bridge gave access to this acreage until it was destroyed by melting spring snow and ice. In 1879 he then decided to build the queen truss covered bridge that still stands today. This beautiful old bridge that Arad built to get his cows safely to pasture had remained in the Copeland family until the fall of 1997 when great, great grandson Robert Tyrrell and his wife Betty graciously deeded the bridge over to the Edinburg Historical Society. This will guarantee that the bridge will continue to receive the same love and care that it’s received for the last 130 years. Happy Birthday by the way! Hogs Back bridge in Northville was an arched stone bridge and was constructed over what was then Hunters Creek on South Main probably when the street was laid out in 1797. It lasted until July of 1859 when it collapsed resulting in injuries. Another stone bridge with concrete floor was built to replace it. This stone bridge lasted until the lake was constructed in 1930. Today the bridge is known as the spillway. As valley population grew so did the transportation needs of the Sacandaga Valley. The Vlaie Creek Bridge was a single lane covered bridge built in 1835. It was deemed inadequate by 1883 at a highway commission meeting. It burned two days later. Speculation appears to be it was burned intentionally by and unknown person probably to make sure the plans for a new one would be carried out. 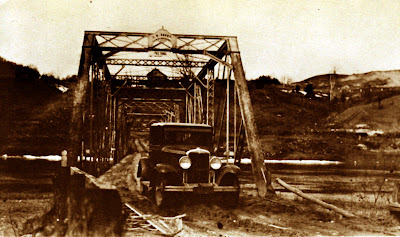 The single lane bridge may have attributed to early road rage. Shouting matches probably ensued over who was to cross first. At least the burning of the bridge waited until the meeting was held to replace it. In 1883 a new lattice Town constructed bridge was built over Vlaie Creek was built and stood until the 1930 flooding of the valley. The first bridge at Conklinville was built in 1852 and lost to high water in 1860. In 1861 a new bridge was built of steel and lasted until the valley was flooded in 1930. It was cut apart and is rumored to still lie seventy feet under the water. 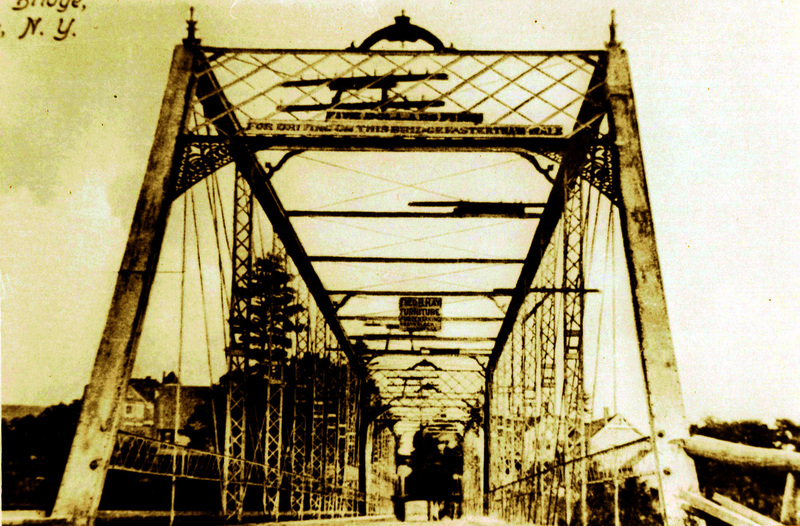 A bridge at Day Corners was a necessity in the late 1800’s. Isaac Flansburg donated the property it was to be built on to speed up the process. He also offered to pay for the abutments and piers if the town would pay for the bridge consisting of steel in three spans . Town officials accepted the offer. Legal questions then arose and the whole problem of who should do what, why, when, and how. This put off construction for several years until In 1904. The whole thing was settled and the town paid the entire cost. References did not relate whatever happened to it. But it too was probably cut up. The Batchellerville Bridge began it’s history as a open wooden bridge 200 feet long in 1801. Construction began that summer and was completed before winter. Made of local hand hewn timber It was lost in a July flood in 1827. A temporary replacement was built right away. This was a floating bridge. Logs were tied end to end and planking fasten crosswise for smooth deck. The ends of the bridge were secured to the banks by heavy chains. This temporary bridge was used for 17 years until 1844. Then a covered 2 span covered bridge was built. No truss style is mentioned in reference. This bridge stood until the 1930 flooding of the valley and was intentionally torched for removal during the Sacandaga reservoir project. The second largest project in the formation of the reservoir was the Batchellerville Bridge in 1929; the Conklinville Dam being the first largest. The 21 span steel bridge is 3,075 feet long and had it’s deck replaced in 1982. On April 30th the bridge was closed to traffic to facilitate in the deck replacement. New York State contracted two ferries boats “The Spirit of ‘76” and “Miss Lake George” to transport people across the lake. Fully covered they offered protection from the weather. There were no vehicle ferries so people had to make arrangements for rides and such on the other side. The bridge reopened two weeks ahead of schedule on Oct 8th 1982. The Batchellerville bridge structure and abutments are now 79 years old. And due for an entire replacement. Most folks would agree it’s overdue. 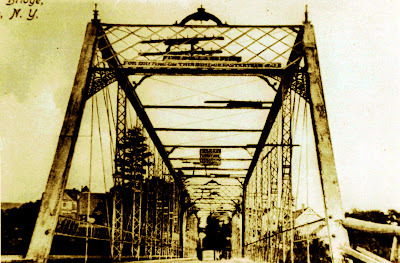 Osborn’s Bridge was of lattice or Town construction built in 1860 and survived until the 1930. Town or Lattice construction was invented by a man named Itheil Town in 1820 . Due to it’s simplistic design almost anyone could build a covered bridge using the Town construction. The design gained much popularity in the northeast. Any community using this patent paid $1.00 per foot royalty and Itheil Town had agents everywhere. Anyone caught building a bridge without having bought a patent had to pay $2.00 a foot. Most of the valley bridges were of this construction. For all the skill in bridge building the bridge was only as good as it’s abutments and piers on which they stood. At the peak of the spring thawing of the river Osborn’s bridge interior floor was covered in water. Osborn’s bridge was swept off it’s foundation. Reference does not note that the bridge may have been destroyed or suffered major damage in this flood. So maybe it was able to be retrieved an reset upon the foundation. Later a dyke of sorts was built to re-route flood waters at the roadways that led to the bridge. Roadways were always the first to flood during an exceedingly high water spring thaw. It couldn’t be found in references how long Osborn’s Bridge was but judging by the photo a guess is about 200 feet. A clipping from June 3rd 1930 reads: Osborn Bridge Burned- The old covered wooden bridge which has been anchored in the water at Osborn Bridge for weeks was burned yesterday by workman of the Hudson River Regulating Board .The burned span was one of the two wooden structures still in the vicinity, the other being Fish House which floated off it’s piers has also been anchored. The threes communities of Batchellerville, Osborn’s Bridge, and Fish House had the largest covered bridges in the area. The latter being the largest. They also had the three most established communities in the Sacandaga River Valley in regards to woodenware factories, mills, and farms. The most number of residents displaced by the reservoir project were also located in these three settlements. When the valley was flooded, these were the Depression years of 1929 through the 1930’s, and although the flooding of the valley brought with it work for many people; others were losing their homesteads and livelihoods to make way for the 283 billion gallon reservoir. Fish House has the honor of being the first settlement in the Sacandaga River Valley in 17–. sir William Johnson favored the spot and built his hunting camp there. This encouraged more people to settle in the area. In 1814 construction started on the Fish House Bridge after Daniel Stewart was contacted for an estimate and appropriations from the state where fought for through petitions of residents and the help of Jacob Shew, relative of Godfrey, that lived in Fish House who served in the legislature. It was a long hard fight but the residents finally won. The bridge would cost $5,500 of which the state provided $5,000 and the rest was raised by donations of the community. Daniel Stewart 23 is credited with the construction of this Burr Arch, two lane, three hundred and thirty six foot long bridge. Many men were hired – some were hand picked by Stewart. Teams of and oxen with stone boats made what was probably hundreds of trips to Bald Top on Maxon Ridge for stone to use in the abutments. There was other stone that would have been closer and not as much work to get, but Stewart wanted only the best in the area. In references he is referred to being very picky about the materials he worked with. The term “good enough” wasn’t in his – “the best” was what he wanted. Mystery surrounds the construction of this area leviathan in regards to the timbers used to make the arched beams that lent support to the bridge. It been argued that they must have been bent when green, others believe they were hand hewn in a arch shape with only a varying of ½ inch in width. Some think they may have been steamed. Still others think it may have been all of the above. There is no mention what kind of wood was used but a guess would be spruce as it grows very tall and straight. The arches were 8”by 12” in width and 125 feet in length. Two spans of the bridge were 106 ft long with the center span at 124 ft. The bridge was finished in 1818. In 1915 the roof shingles were replaced. One hundred and twelve years later in 1930. When the gates were closed at the Conklinville Dam the Fish House bridge remained on it’s foundation for a time after the floodwaters rose. The attempts made by the community to lash it to the shoreline failed when a windstorm blew in . The cables had been attached to the shore at it’s north and south end. The bridge remained on it’s foundation until the storms intensity, which was pounding the waves of the water against it’s sides, snapped the north end cables and the bridge slipped into the water, submerged to it’s roof, but still in one piece. The south end cables held it for a few weeks. In that time it’s constant shifting at the shoreline snapped off three telephone poles which were now at the waters edge. During early July people were draw to the bridge mostly teenagers. Finding the partially submerged landmark fascinating, they were starting to use it to dive off and swim through; which created a potential hazard for injury or death. Other people would come by in motorboats to look at the bridge as it lay submerged under the water adding to the potential danger. Hudson River determined it to be an attractive nuisance of sorts and put the word out that it could be to dismantled. The work was probably done in short order as the economic times would create an opportunity for use of the lumber and sale of some of the parts. The thousands of wooden pegs or pins used to hold the bridge together were salvaged from the timbers and sold by the Ladies Aid Society of the Fish House Methodist church with the identifying Fish House Bridge name and date painted on them. The timbers and uprights were bought by a contractor named Wells Brothers and were used to construct what is called the Greta Room at Old Sturbridge Village in Massachusetts where they can still be seen today. The Fish House Bridge was a huge loss to it’s community that remained. Poems were written about the bridge a verse is included here by Lillian Benedict: So firm a foundation dear bridge you have shown, we could not forsake you and leave you alone. To die in your tracks and be lost from our sight, we love you and for you we just had to fight. And the verse from another reads: Gone are the people and their old fashioned ways. Drowned are the landmarks from earlier days. A new day for the valley has taken it’s toll, where men once built, deep waters roll. There was talk before the final months of the flooding of the valley to try to save Fish House Bridge and move it to a location in Conklinville to use as a museum. But the organization of that was too late in coming. The people who lived in the Sacandaga Valley and surrounding area were mostly convinced that the valley would never be flooded as it was too big of a job. As the reality of what was probably started and dismissed as a rumor grew closer, the shock of it to everyone who would be effected must have been great. Most of us cannot imagine what it would feel like to lose what generations of family members had accomplished in the way of farms, businesses, churches, schools, and livelihoods through the years of growth in the valley. The thought of your relatives who had passed away having to be exhumed and re-interred to higher ground would be, for some people, unbearable. The number of these exceeded 3,800. Offered either much less than their properties were worth, or taken by eminent domain, these people of the valley suffered for multiple reasons. If you were fortunate maybe your home could be moved, as some were, but the view out the windows would be a constant reminder of the change. For the people who did not own the homes they lived in, it still meant finding another place to live and work. The combined number of homes moved or destroyed was 12,000. From all that loss came a new era. From all that destruction a different way of life. And in the years that followed maybe some measure of acceptance; for what else could be done. The Sacandaga River was untamed and contributed to flooding not only in it’s own area, but from Glens Falls to Albany. Also the business of hydro power could grow in the 1930‘s. Northville’s first steel bridge Sign in front reads: A five dollar fine for speeding for crossing this bridge faster than a walk. Note the Inn at the Bridge on the left. Today what is left of Sacandaga Valley history is in history books and in the landmarks we do still have. In our churches, business districts, schools, and the many homes around the lake. They must not be taken for granted as they to have a contribution to make for future generations in the way of pride and attachment to their communities.